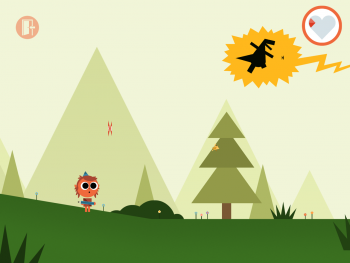 In this interactive adventure from Minilab Studios, children help the protagonist move through a story that delivers concept play and a motor-skill workout. Like King Arthur, Artie, of Artie’s Magic Pencil (Minilab Studios LTD, iOS, $2.99; Android, Free, with IAP; PreS-Gr 1) pulls the aforementioned pencil from a stone and his captivating adventure begins. Hot spots guide users to tap the screen to advance the boy through the landscape. The colorful cartoon fellow likes to help others and there's plenty of opportunity to do so as a fierce dinosaur is destroying everything in its wake. Tapping the light bulb icon that appears when assistance is needed takes users to a creation zone where they are presented with connect-the-dot circles, triangles, or rectangles to complete using their own magic pencils (fingers).